BERNINA Main Street services and repairs all makes and models of sewing equipment. We are proud to have BERNINA certified technicians on staff, and offer a variety of services to keep your machine running like new. Do not bring any other accessories. If you are bringing in your sewing machine and embroidery unit to be updated, please save your designs on a personal design card, CD, or hard drive. There will be an extra $25 charge for sergers that are out of time. Always use a surge protector, especially for your computer sewing machines. An unexpected jolt of electricity (like during a thunderstorm), or a serious under voltage can play havoc with your machines electronic circuits. Never sew over pins. Tiny pieces of broken metal can cause injury and damage to both you and your machine. Should you ever accidentally break a needle, make sure you find and remove all the pieces. The most important component of a stitch is the quality of the needle. Never use dull or bent needles. Replace your needle often, BERNINA suggest after every 4-6 hours of sewing. Needles cannot be resharpened. Oil your sewing machine at least once a week if you are sewing a lot. Refer to your manual for directions on how to do this. Keep your feed dogs, bobbin area and throat plate clean and free from lint. Use the brush that came with your machine, but avoid canned air as it can force lint further into your machine. Internal machine parts need to be oiled once a year, more often if you use your sewing machine a lot. Proper maintenance by a trained technician can avoid costly repairs in the future. If your fabric gets stuck down the throat plate and your machine jams, turn off the machine and remove the needle from the bar. 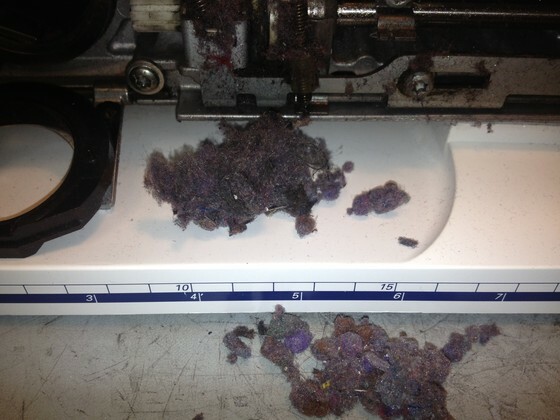 Don’t try to pry it out, as this could cause damage to your machine. Never clean your computer screen with abrasives, acetone or mineral oil. Use a gentle cleaning agent. You can tell if your tension is adjusted correctly when there is some resistance on the bobbin thread and top thread when the presser foot is down. Always thread your machine with the presser foot lever in the up position. The needle should be in its highest position when you start to sew with the thread under and behind the foot. Store your machine where it will not be affected by extreme temperatures, and always keep it covered and unplugged when not in use.